Who doesn’t love a good burger? 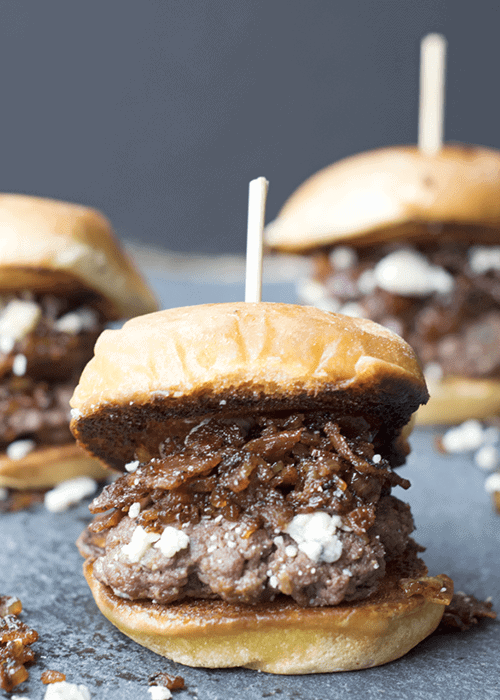 These little Bacon Blue Sliders are a great week night dinner option. You can make full size burgers if you want to eat even sooner! I like sliders because I usually over commit with a huge burger (also I am watching my weight…again). The secret to a good burger is the meat and the seasoning. You have to use chuck which is 80/20. 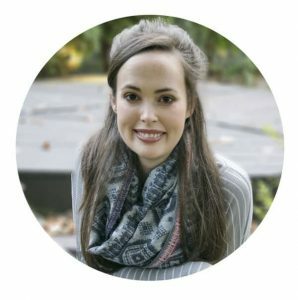 What does 80/20 mean? It’s 80% meat 20% fat. Do NOT use lean ground beef! Your burgers will be hockey pucks. Now I don’t use 80/20 (also called “chuck”) all the time. I use lean ground beef for my taco meat, bake ziti meat, and any other recipe that calls for beef. DO NOT USE IT FOR BURGERS. We have talked about the meat. Let’s discuss the seasoning. Lawry’s Season Salt (this is not an ad) is truly the best for burgers. Add a little black pepper and you have a well seasoned burger! For these sliders I also mixed in 1/4 cup blue cheese crumbles (why not?). THIS IS IMPORTANT: Mix the seasoning into the ground beef, do NOT just sprinkle it on top of each burger. By mixing everything together the seasoning will be evenly distributed throughout the entire burger. This step is really the most important. After everything is mixed together, form your patties. Then take you thumb and push it into the middle of each patty creating a dimple. This will ensure an even thickness (the middle tends to balloon up in the cooking process). Cook each patty for 3-5 minutes on each side (or to whatever doneness you like). Garnish with delicious Bourbon Bacon Jam and more blue cheese! 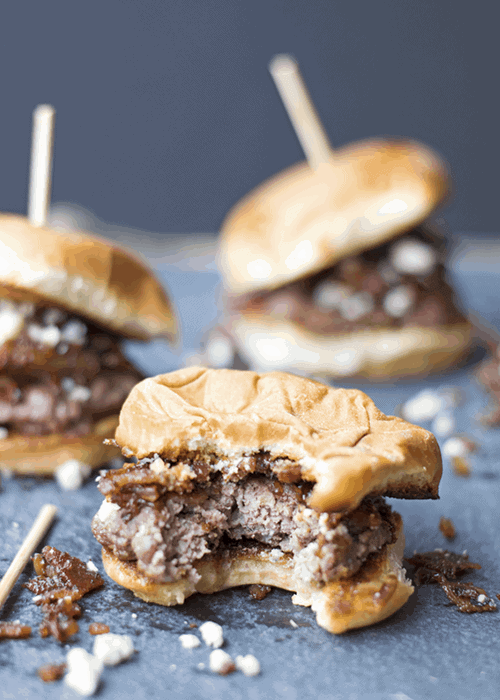 Bacon Blue Sliders make an easy quick dinner. 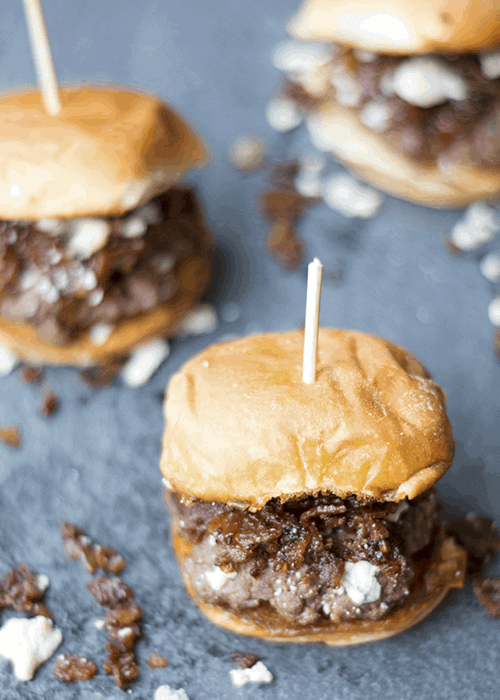 You can add whatever condiments you want to these cheesy sliders, but I prefer Bourbon Bacon Jam! Heat up a large skillet over medium high on the stove. 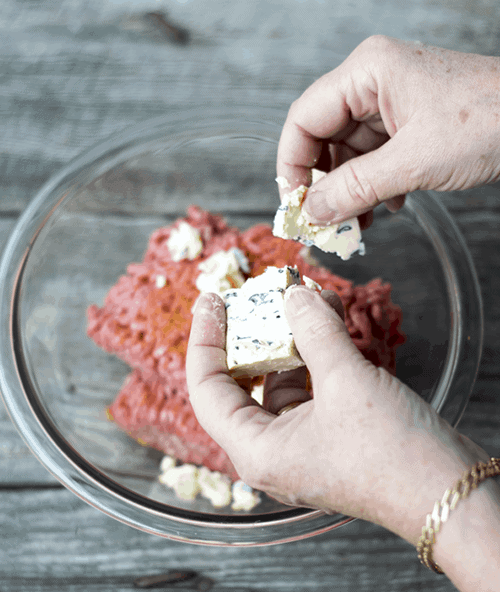 In a medium bowl, mix together the beef, blue cheese, and seasoned salt. Form into small patties. Place each patty into the hot skillet. Cook the patties on each side for around 3-5 minutes (depending on how well you like your burgers). 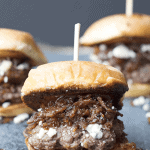 Put whatever garnishes or condiments you like on these blue cheese sliders.